The excavation team have moved to another location in Loot Lake, but the site will probably appear in the next update. Here is a theory as to why the sites are appearing. Epic Games haven’t introduced a new map to Fortnite, but instead have been updating the current one by removing POIs, adding new ones and other minor changes. Some of these changes may relate to the storyline, such as Kevin the Cube moving around in Season 6 and in this season, we have a helicopter moving around the map and new excavation sites appearing around the map. It is thought that another excavation site will appear, but it will not appear until the next update as data-miner FortTory had found the dig site files previously, but none have been found in the v8.30 update. So I dont think we will get a new diggingsite before the next update. 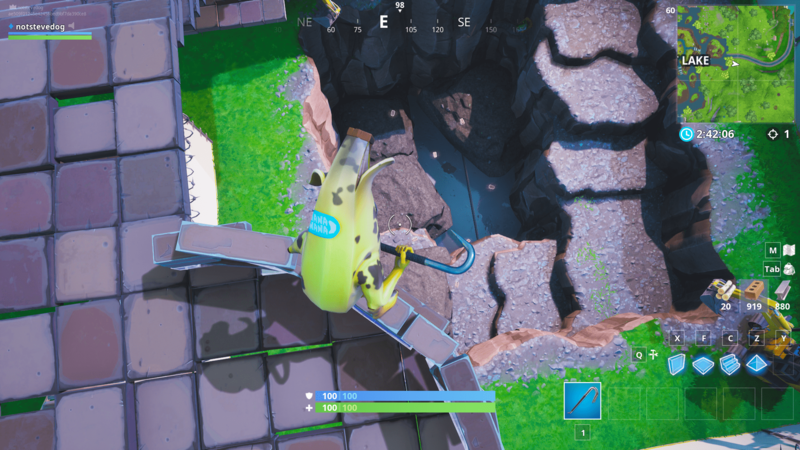 I havent seen a new diggingsite in the files and I cant find any in replay mode. 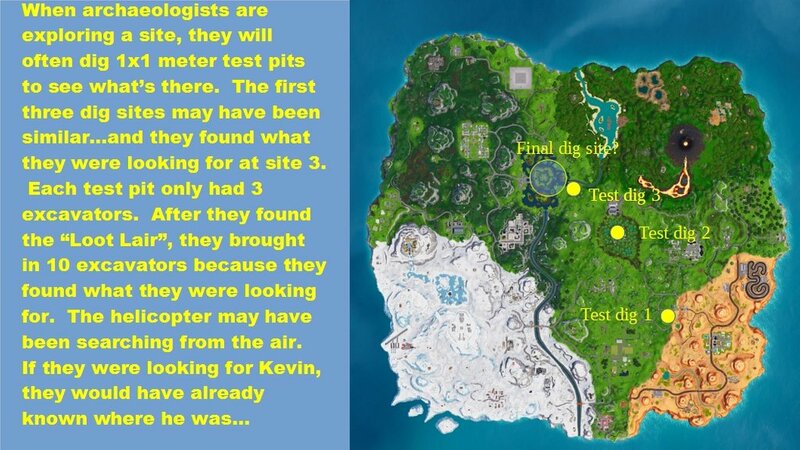 No one knows why the excavation spots have appeared but the most popular theory is that someone is looking for the remains of Kevin, as the last place the cube was seen is in the middle of Loot Lake and it seems they are taking a closer look at the lake. He went on to explain more in the comments. “So, with the excavators unloading on the east shore of Loot Lake, it looks like that’s going to be the big dig. It might seem obvious that this has something to do with Kevin, since that’s where his remains are (and where that energy goop or whatever it was dropped in the swirling hole in the ground), but it’s very possible this is something completely different. If the Government was looking for anything to do with Kevin, they wouldn’t have had to search at all, it’s been sitting in the middle of the lake since Season 6. Instead we’ve got a helicopter circling the island, and what look like test pits being dug in three different spots. The first three digs form an almost straight line from the desert to loot lake…if they hadn’t found what they were looking for, it seems reasonable they would have kept digging along that line. Epic have hidden the Week 8 loading screen for the Discovery Challenge and so it seems that the next update will require some downtime, meaning we could see some huge map changes and possibly a new event, but only time will tell. 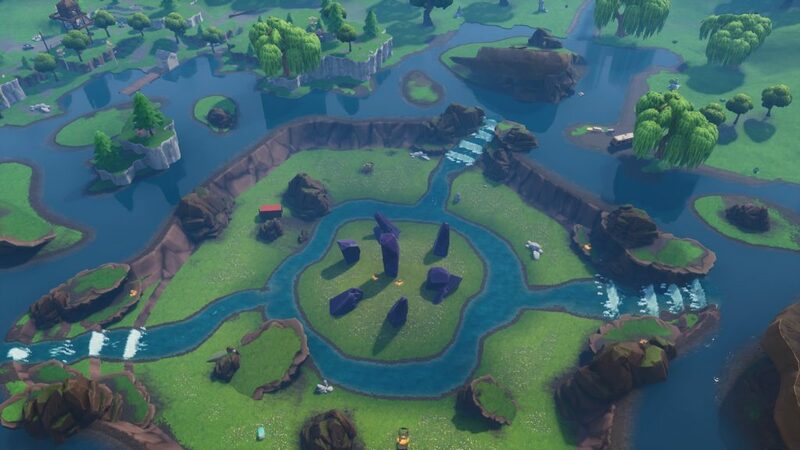 Do you think they are looking for Kevin the Cube and what changes do you think they will make to Loot Lake? Let us know in the comments below. I actually think its connected with the discovery skin ruin. Ruin looks like an old skeleton or something like that so i suppose the are searching either kevin or ruin. Thats what i think so. ruin has to be in the cube! It would make sense the cube is coming back but how? It is now a bunch of atonea in the middle of loot lake. It would be cool if Ruin (who looks a lot like black knight) was inside Kevin, but was he trapped? Was he controlling it? Did he make it and if so why? Whatever these excavation sites are, Ruin is at the bottom of it.